The two thick envelopes arrive monthly for the wife and me, each 12 pages of lists of what drugs we bought that month, how much we paid, plus the amount Humana insurance contributed. If you just file this document, and don’t check the numbers, it may cost you a load of money. 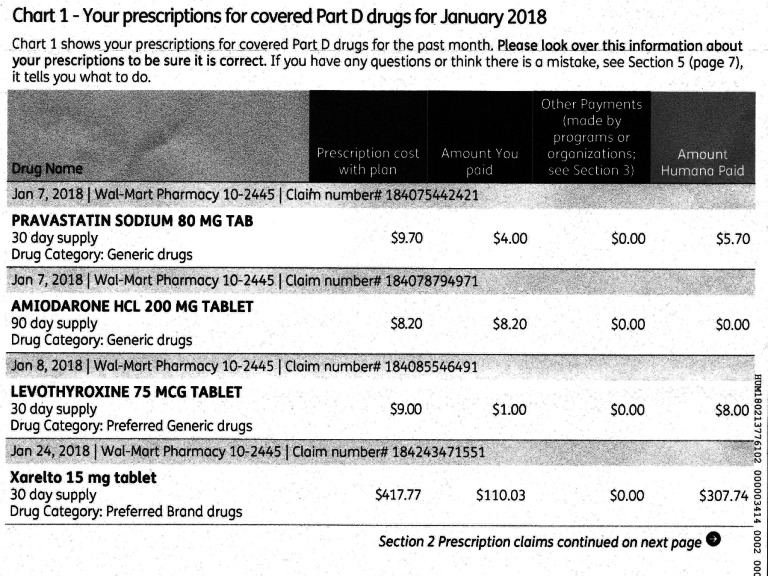 I learned this when I reviewed my January 1 to 31 Humana recap for 2018, and found that the total for prescriptions in the year was about twice the total for the month. One month in the year expense should always equal the year-to-date total. 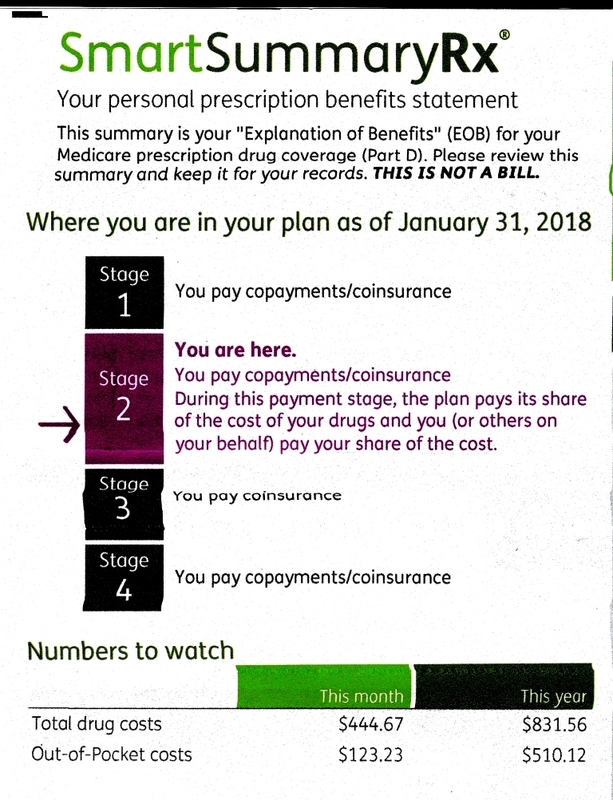 This same error appeared three times in my statement, and the higher annual total would take me into the Medicare prescription donut hole faster by nearly $400. The hole is where you pay 35% of the list price of drugs, rather than lower co-pays. I decided to call Humana the Saturday I discovered this anomaly, and that’s when everything started going downhill. A robot answers. It asks me for my date of birth, and the machine keeps telling me to repeat, because it doesn’t understand. I try using a Bombay accent, but still no luck. Finally, I get to a stage where I can enter birth date on phone number pad, and then I learn the bad news. There is no phone customer service on Saturday or Sunday, only weekdays. My next step was to try and solve the overcharge by going on the web to view my account. Whoops, seven months had passed and I wasn’t allowed to see my records unless I followed a series of steps. Thought I did as told, but nothing worked. I was almost stymied. Raging through the Humana website, I noticed the possible solution to my prayers. Chat online beckoned. It’s simple. You type in your questions and someone, somewhere (probably an underpaid villager or even a prisoner) types back the answer to you. What could be easier, even fun! Opened the window. Typed in the question. the answer: we don’t chat on weekends; try Monday through Friday if you want customer service. Saving money is important. Humana CEO Bruce Broussard’s total compensation was flat at a mere $19,800,000 in 2017. It was a tough year for the Louisville-based company, which refocused its strategy after its failed merger with Aetna and shed thousands of jobs. While the employees who lost their jobs in 2017 may suffer financially, when Broussard leaves he gets a reported $40,100,000 severance. 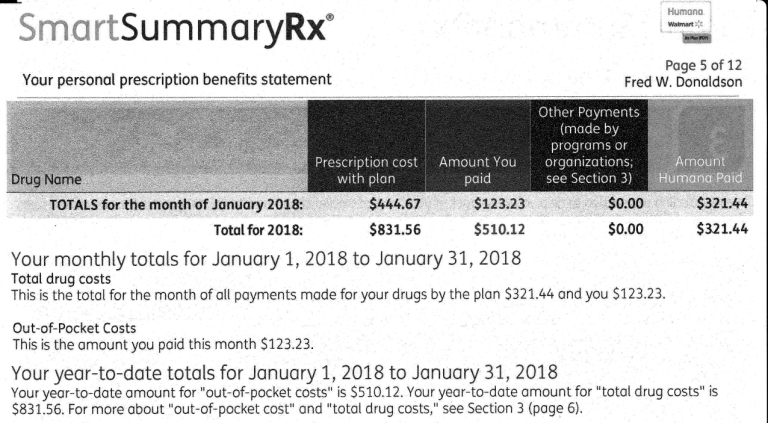 January 31 statement Rx shows total month drug costs $444.67. It also shows this year total drug costs of $831.56. I imagine that Humana might find this a problem and your algorithms should have flagged it. Writing because you are saving money by not being open on Saturdays – total inconvenience. This is the $444.67 amount reflecting only what you have paid. What others (programs or organizations) pay for your drugs. This is the $831.56 reflecting the total cost of drugs/what Humana has paid. Your policy has a deductible of $405; this amount is only an accumulation of what you have paid. Your $3750 initial coverage limit and $5000 true out of pocket, however; are an accumulation of both what you and Humana pay. On the final two pages of your SmartSummary Humana provides an in depth explanation of how and what goes into the amounts you see reflected. This information can assist you in understanding why two such different amounts appear for the same month and why both amounts are correct. I wasn’t looking forward to calling Humana on Monday. What would happen if Amanda answered? Could I patiently explain to her over and over that the total for the first month of the year equals the total for the year-to-date, as of January 31. Years as a division CEO of a NYSE traded public company had taught me that some of the dumbest folks anywhere decide to major in Business, and also some of the smartest. When I called Humana, “Dillon” answered the phone. Folks in billing departments are wise not to use their real names, just in case an irate customer is also a nut job, who will find out where they live. Unlike Amanda, Dillon had a brain and listened, checked with others in the department and came back to explain the statement I received was wrong and a corrected one was being prepared. I sure wish I could have talked to him on Saturday.